Homemade “McMuffin” Swap | Hapa...Shot the Food! It’s been a while, I know… I had to take a bit of a hiatus at the end of the semester (and used the subsequent month to recover from it). Hopefully, I’ll be a little better with updating. In keeping with the resolution I made to myself last year to take a little better care of myself, I’ve been working out and watching what I eat. 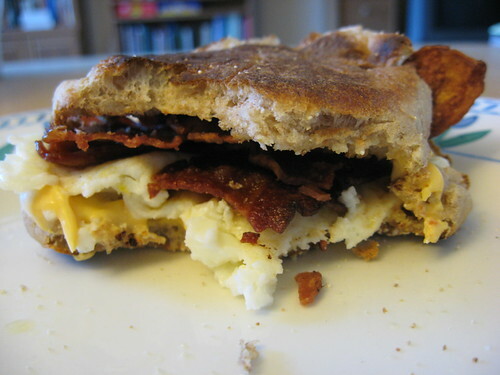 This morning, I had several “less-guilty” ingredients on hand, making a “guilt-free breakfast sandwich out of them. 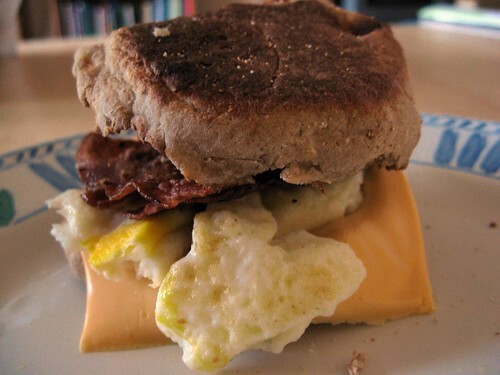 Ingredients: My regular English muffins (Thomas’s Honey Wheat, double-fiber, 1), turkey bacon (2 strips), nonfat American cheese (1 slice), and egg whites (1 egg)*. Let’s just say I’m not gonna miss you, McDonald’s. * The flavor of the bacon and cheese balanced well with the egg whites, but if you prefer your eggs a bit yolkier, egg-beaters are a great egg substitute. 2% cheese will also work well if you prefer that to nonfat. 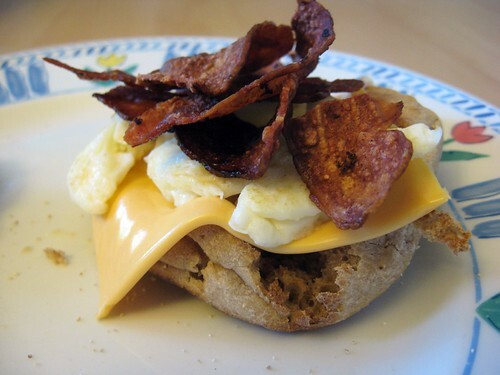 Posted on February 1, 2009, in recipe, Uncategorized and tagged breakfast, guilt-free, healthy recipe swaps. Bookmark the permalink. 1 Comment. That looks like my kind of breakfast. I’m going to try this very soon. Thanks for sharing!